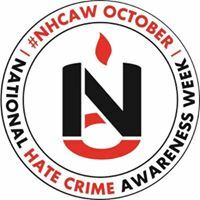 National Hate Crime Awareness Week (HCAW) runs from the 14th – 21st October 2017. Hate crime is a widely unreported problem as victims don’t always think a crime has been committed. Activities in Hate Crime Awareness Week aim to provide a greater understanding about what constitutes hate crime and how it can be reported within Warwickshire. We also aim to promote community cohesion and unity, supporting the principles of #WeStandTogether – a national campaign that encourages people to come together as one and celebrate their differences in order to build a safer and stronger United Kingdom. What activities are planned in Warwickshire? Music can be a powerful way to raise awareness of an issue. Inspired by lyrics penned by a local Warwickshire police officer based in Nuneaton, a music track has been written and produced that highlights the harm that hate can cause. The producers and artists on the single have donated their time and expertise for free on this project. A video has also been produced to accompany the track and students at Avon Valley School in Rugby play the starring roles in the film as well as being involved in the editing and production. The single and video will be available to download from October. Volunteers are needed to run community tea parties to support HCAW. We want people to come together to fight hate in their community with a tea party that embraces our differences and promotes cohesion. Events across Warwickshire are being co-ordinated and supported by the local Safer Neighbourhood Policing Teams. Anyone can apply to be a host of a tea party. The idea is to utilise existing venues and “get togethers” – coffee mornings, toddler groups, playgroups, faith groups, community hubs. They are just re-branded temporarily for HCAW and members are encouraged to bring along cakes and biscuits to share. Hosts will receive a free pack that contains hate crime resources (posters, stickers, leaflets, bunting, pens, snapbands, keyrings). We are encouraging photos of the tea parties to be shared via social media with the hashtag #CakeNotHate. If you would like to run a tea party, contact communitysafety@warwickshire.gov.uk. Watch out for a tea party near you! A new partnership website has been created which provides information and advice on Hate Crime and also a portal which enables the reporting of incidents in Warwickshire. The site has been developed in conjunction with Warwickshire County Council, Warwickshire Police, The Police and Crime Commissioner and EQuIP (Equality and Inclusion Partnership). It is hoped that by having a dedicated resource that provides an alternative method of reporting incidents, the reporting of hate related incidents and crimes can be increased. The site also provides customised support for victims and witnesses which can help ensure that they get the help they need more effectively. The site will go live from the 17th October 2017. If you would like more information about any of the events or activities we have planned for HCAW please contact communitysafety@warwickshire.gov.uk.